March 17, 2013 - Make sure you like EcoJoes on Facebook to stay updated on green ways to save money and help the environment. Just click the "like" button below. Muchas gracias! Hello there! And welcome to EcoJoes dot com! Say, do you ever get a hankering for some locally-raised, newly-ground hamburgers on fresh-baked buns? Well have I got a treat for you. 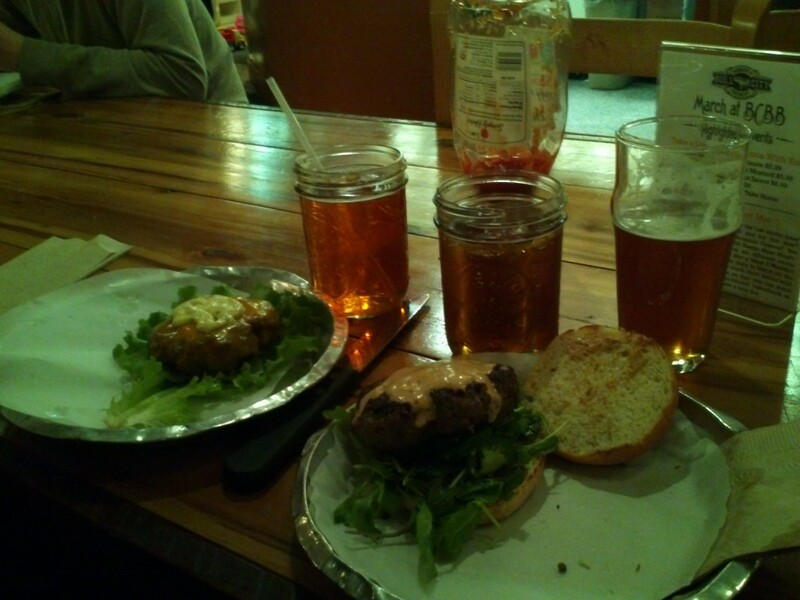 Bull City Burger and Brewery is a locally owned, independent burgershop n’ brewery located in “The City of Medicine”, Durham, NC. Not only is most of their food from North Carolina farms (helping the local economy while reducing the pollution caused by transporting food), but they make almost everything onsite, including sauerkraut, house-made buns, slaw, pickles, mayonnaise, etc. Also, BCBB doesn’t use any high fructose corn syrup or artificial sweeteners, and also no hydrogenated oils. So not only is it local food, it’s healthy for you (well, as healthy as fast food can get, at least)! If you visit this place, you’ll probably notice the room of giant metal vats behind a clear glass wall. This is where they brew the heck out of some beer. I had one of them (can’t be getting too tipsy), and it was delicioso. If beer’s not your style, they also serve farm-made wine from the amazing Enomatic self-serve wine-dispensing machine, which I didn’t try, but will one day, inshallah. Their food is amazing — March is their “Exotic Meat Month“, so I had me a venison burger. It was tougher (and redder) than a normal burger, but really tasty. Oh yeah, since they grind their beef here, they’re willing to cook your hamburger rare, which I haven’t seen at any other hamburger place in a long time! Their commitment to sustainability doesn’t end when you’re done with the food, no sir; their used cooking oil gets recycled and turned into biodiesel. Leftover grain from their brewing process (and 99.9% of their food waste!) goes to feed the locally farmed pigs and chickens that they use for their bacon and eggs. Bull City Burgers is in an old, renovated building, so they’re reusing it. 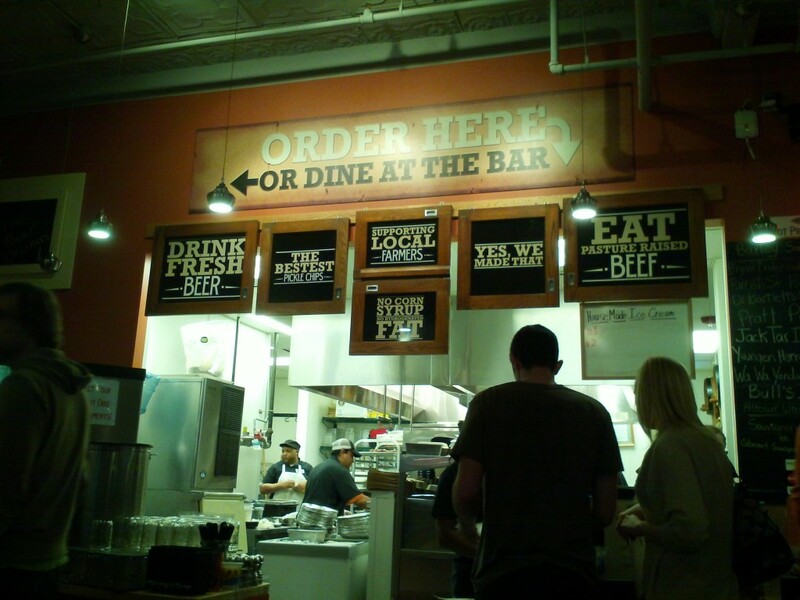 Not only that, but their tables are made from old barn wood, and most of their lighting is LED, which uses a fraction of the electricity that “normal” lights use. Hot dang. The one downside is that all this quality comes at a price. The venison burger alone was $13 (!!!). So while I won’t be going here too often, whenever I do, I’ll definitely be satisfied with the food and the environmentally responsible way they’re running their biz. 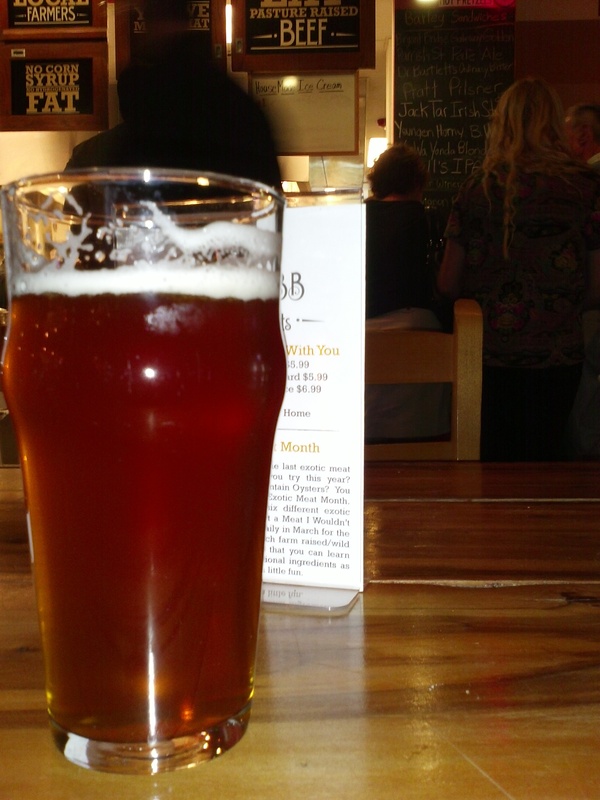 Posted in eco footprint, food, green business	on Sunday, March 17th, 2013 at 4:54 PM. That looks amazing. Please take me there next time. I think a venison burger is totally worth $13. Man, I shall. They really do have great food, but you gots to pay to play, as they say. I agree with the expandable waistband! This is a great flavorful burger. So many great things come together and yes to a chilled beer with this!